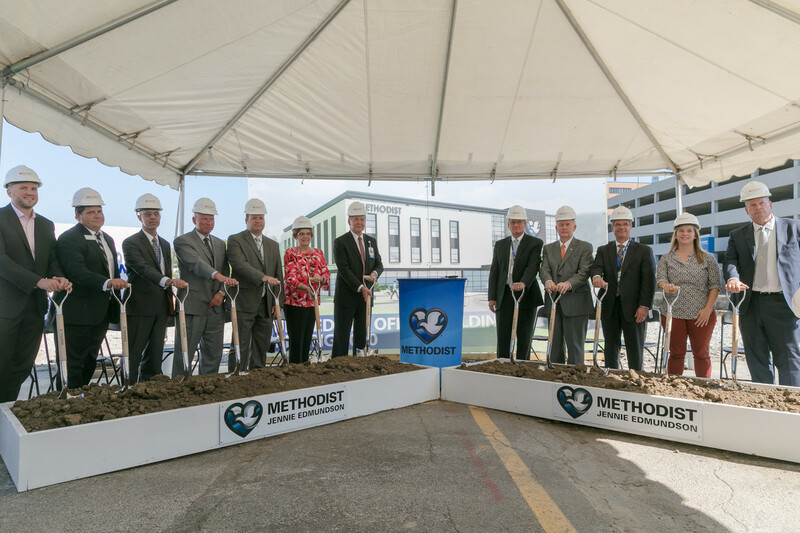 Looking to enhance health care options for Council Bluffs and western Iowa families, Methodist Jennie Edmundson Hospital broke ground on a 60,000-square-foot medical office building on Thursday, Sept. 20. Hospital, Methodist Health System and Methodist Physicians Clinic representatives, along with Council Bluffs Mayor Matt Walsh, were present. Steve Baumert, president and CEO of Methodist Jennie Edmundson Hospital, first announced the $18 million project in May. Bound by Ridge, Kanesville and East Pierce Streets, the new building will become home to primary care physicians, women’s services and urgent care services. A healing garden will be a highlight of the exterior and provide a calming retreat for patients and staff. The first floor of the medical office building will provide clinic space for approximately 15 Methodist Physicians Clinic primary care providers. It will also include an imaging suite, as well as a new Urgent Care location with easy access and extended hours. Another important aspect to the new building is a focus on women’s health care. Women’s services will be located on the second floor and feature up to six women’s health experts, as well as outreach clinic opportunities with Methodist Women’s Hospital maternal-fetal medicine specialists. Use of the third floor is yet to be determined, but officials are in discussions with a number of potential physician groups. In conjunction with the new medical office building a new employee parking lot is currently under construction. The new lot, which will be located closer to the hospital entrances, will improve hospital employee access and safety. Construction of the medical office building is underway with completion anticipated by early 2020.